What kind of pain medicine can you give a dog? Is it safe to give dogs ibuprofen? What is Pardale for dogs? Can you give Advil to a dog? I’ve given a paracetamol dose to my dog, what do I do? It’s best to start off on the right foot and declare that NO! You should NOT give a paracetamol dose for dogs or any animal for that matter. Paracetamol, otherwise known as acetaminophen or APAP is a manufacturer pain relief medicine designed for human consumption only and can be highly toxic to dogs – the main effect being very serious liver damage. Paracetamol is a very popular painkiller for humans but it can be toxic or fatal in small animals. Dogs are less sensitive to paracetamol than cats. A 20 kilogram dog would need to ingest over seven 500mg tablets in order to suffer toxic effects. Paracetamol may be a mild drug to us and many people will say it doesn’t do anything but the drug has been designed with our biological system in mind and not dogs, similar to how chocolate is a treat to us and potentially dangerous to dogs. Be careful to not confuse paracetamol (the drug) with name brands such as Panadol, Nurofen, Strepsils, Calpol and so on – these are all paracetamol or paracetamol including products. If you’re reading this then you may have a dog who’s unwell and showing signs of pain and discomfort. Before even considering giving anything to your dog determine what the root cause is! What’s the best way to find out what’s wrong with your dog? Take him or her to the vet of course! Veterinarians are experts in animal welfare and they’ll take a good look at your furry friend and help with finding a cure or give advice. Never, ever try to medicate your own dog with paracetamol or anything else – go and see a vet as soon as possible! all however, a paracetamol dose should be the last thing you should try. First of all, make sure to see a veterinarian to determine the underlying issue – finding the cause is the best thing you can do. hikes, long walks, bike rides and so on. These should be not be used as a first option if you believe your dog to be unwell. MUSCLES AND JOINTS - Provides relief for sore, stiff muscles and joints in very active dogs as well as senior dogs. VET'S BEST - Veterinarian formulated and made in the USA. Each bottle contains 50 chewable tablets. 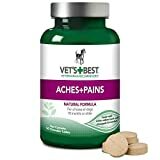 Some users of these chewable tablets have reported some dog’s may not gobble them up straight away so you can break them down and spread over their food or jam them in to a chunk of wet food. If you have a larger breed of dog who may be suffering from joint paint then a joint supplement may be a better alternative. It is not safe to give ibuprofen to dogs. Even in small doses ibuprofen can have serious negative effects to a dog and care far outweigh the pain relief. Giving ibuprofen to dogs can have very similar effects as paracetamol. Do not give ibuprofen to your dog under any circumstances. Pardale (or Pardale-V) is an analgesic (painkiller) for dogs. Pardale are almost exclusively prescribed by a vet as they are very strong and suitable following a traumatic injury or arthritis. Pardale should never be abused and only used when the dog has been prescribed them or recommend by your vet. Essentially, Pardale is paracetamol for dogs as a tablet does indeed contain paracetamol. However, it must be stated that Pardale-V has been manufactured for consumption by canines ONLY. No, you should not give dogs Advil. Advil is a branded version of ibuprofen. Even if you don’t suspect a paracetamol dosage to be involved take your dog to see a vet if you see any of these symptoms.